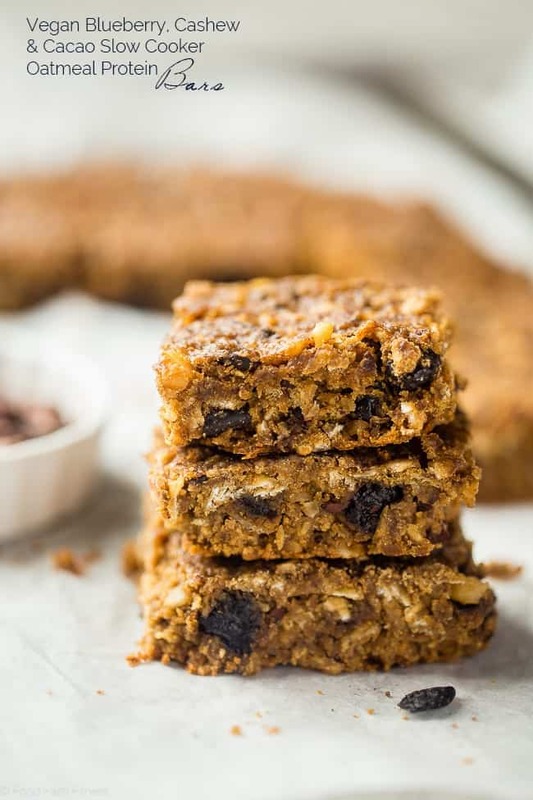 Just wanted you to give your taste buds a little heads up that these super simple, super yummy protein bars are sponsored by my friends over at Better Body Foods! 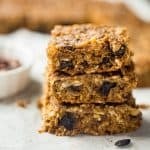 These easy homemade protein bars are made in your slow cooker, packed with superfoods and are gluten free and vegan friendly! 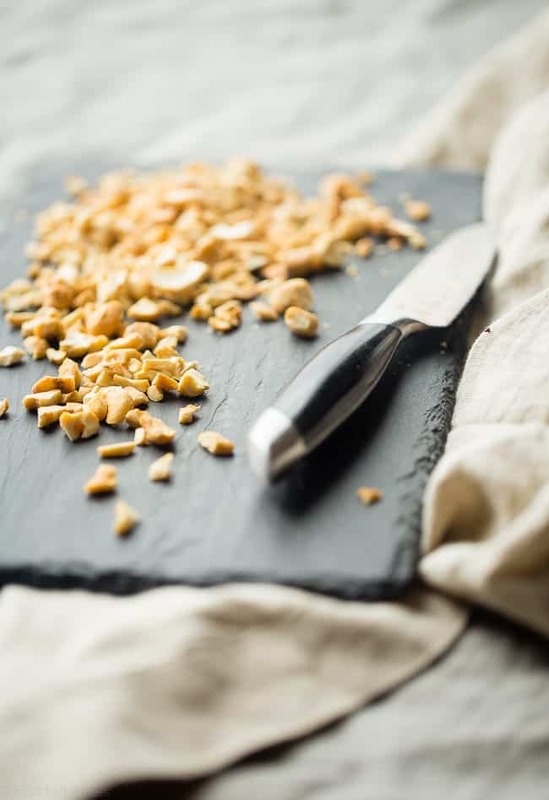 Perfect for busy mornings or a healthy snack! Mind blown. Totally freaking out right now. SRSLY GUYS. These dense-yet-chewy, crunchy-yet-soft with the most perfect combination of sweet blueberries, salty cashew butter AND RICH chocolate-y cacoa, bars are EVERYTHING. Everything in the sense that they are SOSO yummy, are packed with superfoods & PROTEIN, are friendly for my vegan peeps (HEYO!) AND you have to do negative amounts of work to create them. The slow cooker does it all for you. Super favorite. Winning at life right now. These homemade protein bars are sort of a mish-mash of F-O-U-R different recipes that basically broke the internet because you guys decided that you enjoyed them A LOT: the slow cooker quinoa energy bars, crock pot paleo cookies with chocolate chips, oatmeal breakfast bars and the superfood quinoa salad – which was my first introduction to cacao nibs. And now I can’t resist just adding a little sprinkle into everything that is FOOD. It’s all about that little chocolate-y crunchy X-PLOSION of superfood, healthy deliciousness ya KNOW? 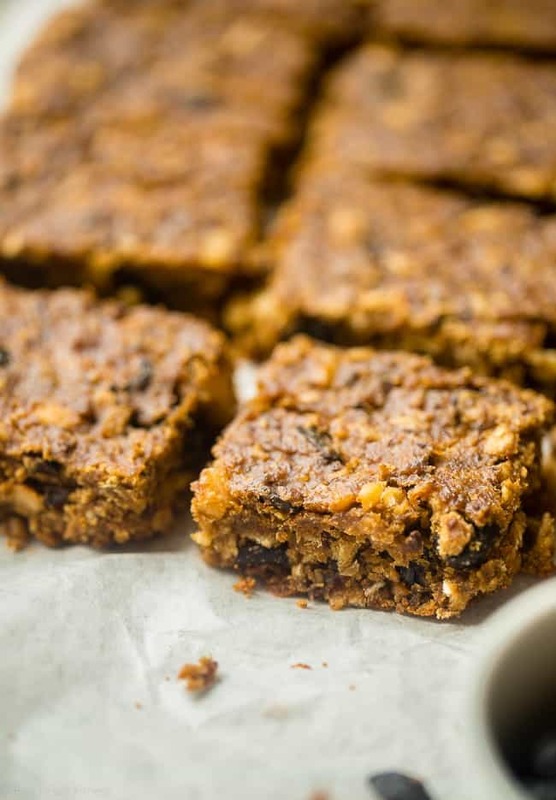 On the topic of healthy deliciousness, that is what defines these snack or breakfast bars. Like you may have inferred from the title/recipe instructions, you do NOT even have to turn on your oven to achieve your morning-person healthy breakfast goals OR your healthy afternoon-person snack goals. Slow cooker = magical cooking device. Another title-suggestion is that, besides being ridiculously packed with the good-for-u food of the super variety, these SUPER-simple, texture-bomb bars, that are defining my life right now, A-L-S-O have a little protein boost from Better Body Foods New Organic Livfit Plant Protein Powder. 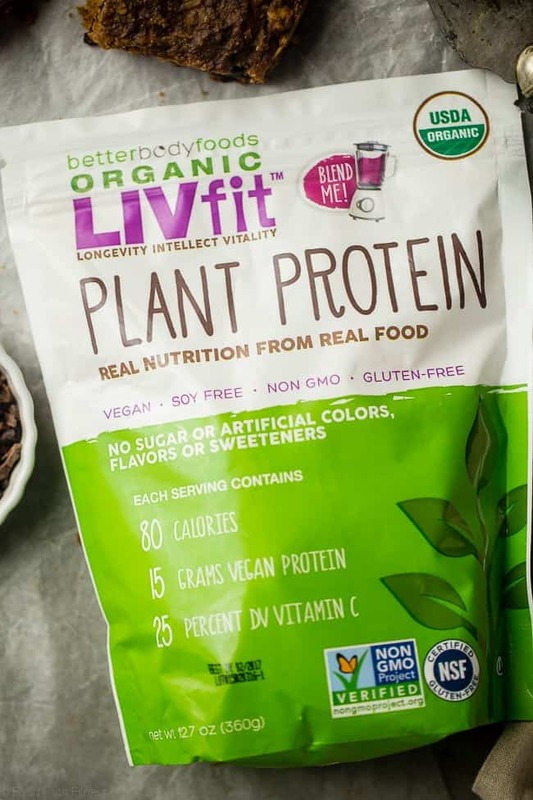 I introduced you to this plant protein powder’s cousin, the Livfit Superfood Blend, in the healthy blueberry muffin breakfast cookies, and now you’re getting the whole protein-packed SHEBANG. And, you’re going to realllllly like it. Like, a lot. Vegan-friendly protein + wholesome carbs + healthy fats + chocolate-y cacao crunch = happy you eating balanced, nutritious and DELICIOUS food. Also equals totally satisfied-you. No more of those times when you have to give in, mid-morning to that hungry snacking mouth. Unless you’re snacking on more protein bars. That is VRY, VRY allowed. 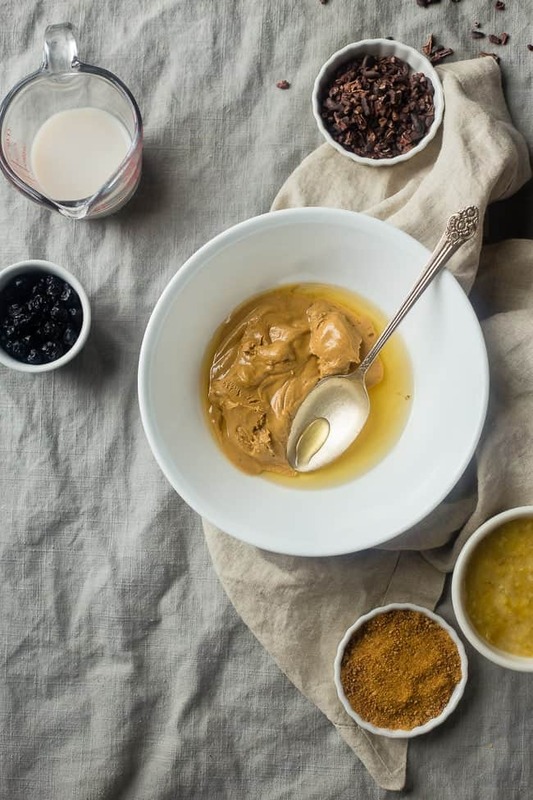 Like we discussed in last week’s protein cookies, cashew butter goes well with just about EVERYTHING (especially a spoon and your face) which means you COULD even switch up the blueberries/cacao/chopped cashew dealio that is happening in this recipe. You know, if you are totally weird person who does not enjoy the delicious thing that happens in your mouth when chewy blueberries combine with dark chocolate and salty cashews. I will only judge you silently. JOKES. Orrrr you could take my pinky-promise that the blueberry+cacao+cashew flavor profile is everything that will make your mouth experience happiness and health, as 100% TRUF. Mix together the flax meal and warm water. Place into the refrigerator for 20 minutes before you begin making the bars. 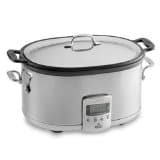 Rub a 7 quart slow cooker with coconut oil, or cooking spray and line the inside with parchment paper, leaving enough overhang so you can use it as a handle to get the bars out of the slow cooker. The cooking spray with help anchor the parchment paper in. I found it's easiest to trace your slow cooker on a large piece of parchment paper, and then cut a few inches bigger around so that you have enough to leave that overhang. 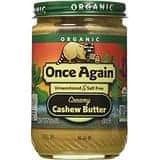 In a large, microwave-safe mixing bowl, microwave the cashew butter and agave until the cashew butter is smooth, about 1 - 1.5 minutes. Beat with an electric hand mixer until smooth and combined. Add in the mashed banana, coconut sugar, almond milk, vanilla extract and the chilled flax eggs. Beat again until well combined and runny. Add the oatmeal, oat flour, protein powder, cinnamon, baking powder, baking soda and salt into the bowl and mix until very well combined. Add in the dried blueberries, cacao nibs and chopped cashews and mix until evenly dispersed. Your batter will be pretty thick! Spoon the batter into the prepared slow cooker and spread out evenly. *I buy my cashews pre-toasted. If yours are not, place them in a 350 degree oven for 10-15 minutes. **You don't want to over-bake these or they will be dry, so keep an eye on them when you think they could be done. Mine were perfect at 2 hours. If your slow cooker is smaller, and your bars are thicker, it may take a little longer! 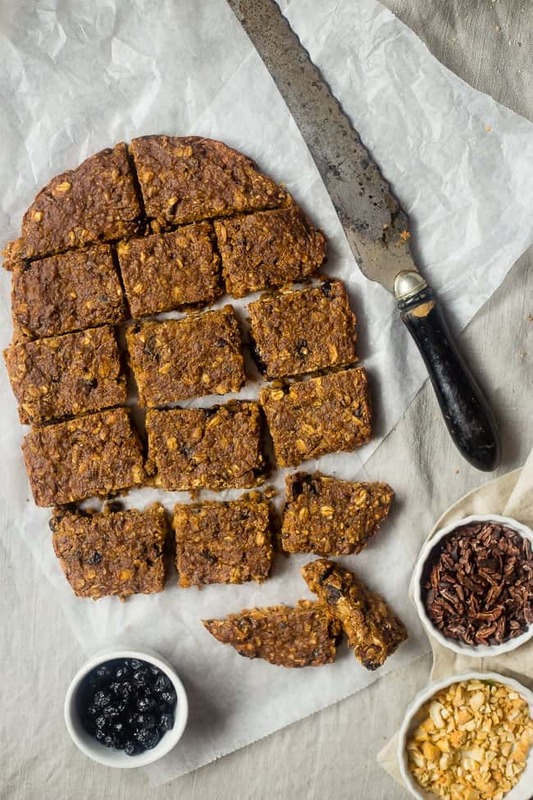 protein bars made in a slow cooker? HOLY GOODNESS! Slow cookers are BAE! I need to use mine more for baking purposes though, like these gems! You Rock! Hahaha! Thank you so much lady!! No freakin way!!! Gurrrlll – this is plain genius!!!! 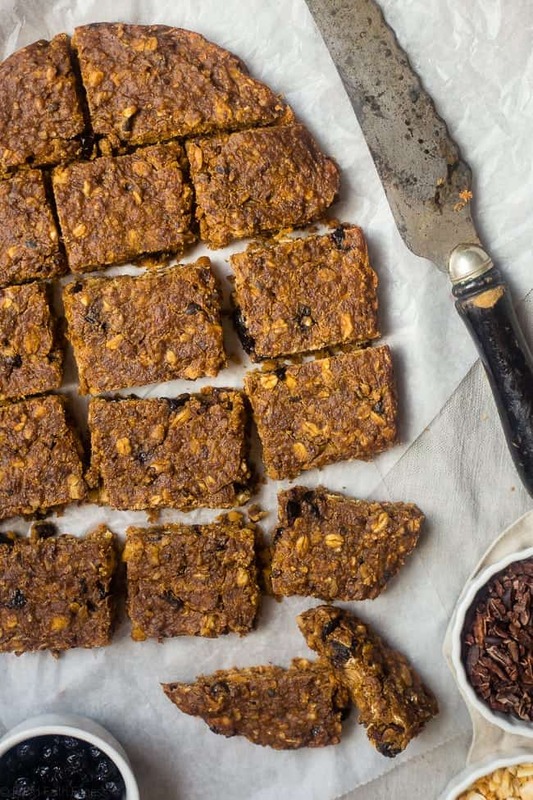 Healthy protein bars in a slow cooker?!?!? DANG DOOGELY!!! Brilliant! No – these are beyond brilliant! Thanks so much for sharing! I am always looking for ways to use my slow cooker more! Bookmarked! You are a mad scientist Taylor, love these! Baha it’s true 😉 Thanks! Ok, I STILL haven’t hopped on the slow cooker bandwagon but I think you’ve tipped me over the edge. I need these in my life!! Gorgeous photos lady.. you’re making me wish for breakfast round 2 this morning! Thank you Angela! you NEED to get on the slow cooker train! I need to make a batch of these so I stop snacking on the garbage my husband buys. 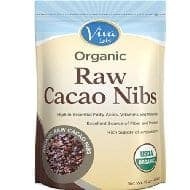 I love the dried blueberries, cocoa nibs and cashews added in! These could be the answer to get me over that mid-morning slump!!! In the slow cooker? Seriously, I need to try this. Total game changer. Pinning for later! It is amazing! Thanks girl! Love that you made these in the slow cooker, these look amazing Taylor! Ahh I wish I had these cooking in my slow cooker right now!! So good!! I like your chewy/crunchy/soft description!! It’s all about texture! Thank you! need these in my life asap! I rarely ever use a slow cooker but now I totally have a reason to pull it out of the bottom back corner! lol 😉 a really good reason! these would totally take over my life when that afternoon snack attack crash comes! YUM yum yum!!! plus totally loving how soft and moist they look! Hahaha YES do it girlfriend, it makes them so soft and chewy!! Happy weekend!! Never would’ve thought to make protein bars in a slow cooker. Just brilliant! Glad you like the idea! Thank you! Made in a slowcooker? Genius! 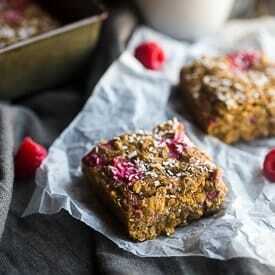 Little bars of magic that are healthy AND made in the slow cooker?! How cool is that?!?!?! I cannot wait to hunt down a slow cooker just to make these! You NEED a slow cooker girl – they are seriously the best! Thanks! 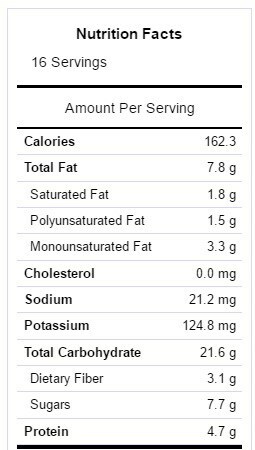 What stores can you usually find the plant protein in? Can’y find it in Trader Joes :(. 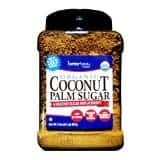 Scroll down to the bottom of the page here :http://www.betterbodyfoods.com/ they have a list of stores that carry their products! Hope that helps! 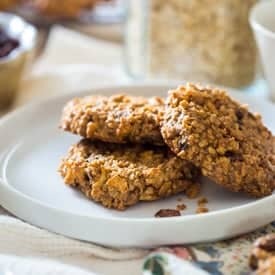 Can I use almond flour instead of oat flour in these? I can’t tell you as recipes are only tested as written, I’m sorry! 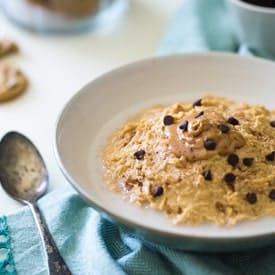 What can I substitute for oatmeal and oat flour? Hi there Susan! Recipes are only tested as written, so I’m not able to tell you. I’m sorry and hope you understand.